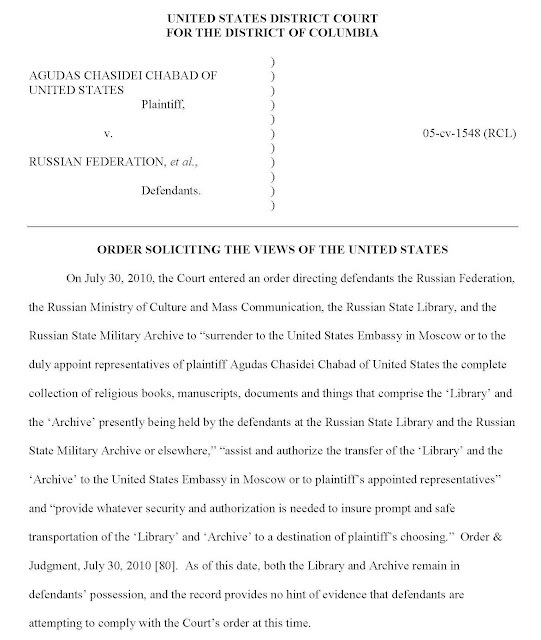 Following up on an earlier post "Possible Contempt Sanctions Against Russia over Jewish Archives" (read that for the full background and see also this post on related negotiations) Judge Lamberth has now entered a new order in the Chabad v. Russian Federation case inviting the U.S. government to submit its views on possible sanctions against Russia. 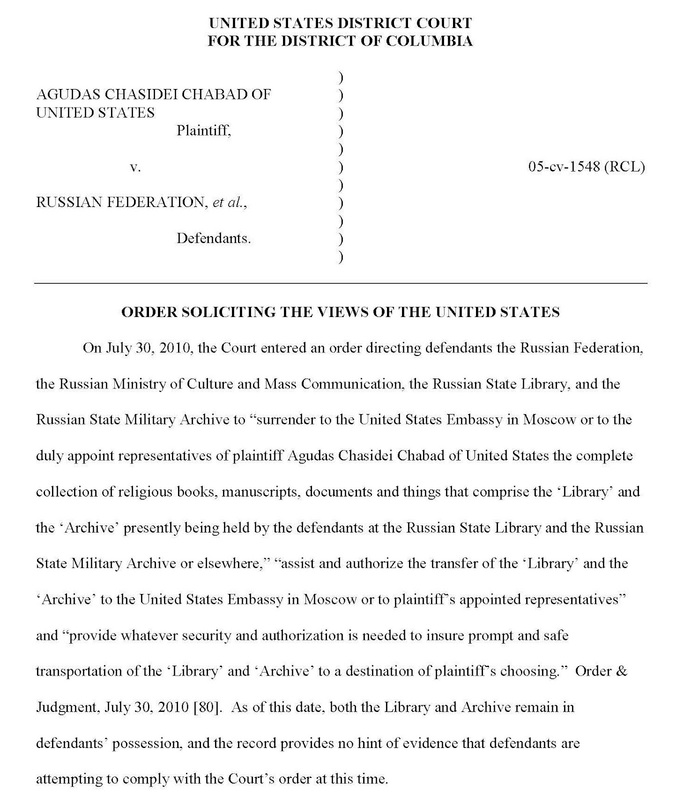 Judge Lamberth's order recites the relevant facts that on July 30, 2010 he ordered the Russian Federation to "surrender to the United States Embassy in Moscow or to the duly appointed representatives of plaintiff Agudas Chasidei Chabad of the United States the complete collection of religious books, manuscripts, documents and things that comprise the 'Library' and the 'Archive' presently being held by the defendants at the Russian State Library and the Russian State Military Archives" and that, as yesterday's date, "both the Library and Archive remain in defendants' possession, and the record provides no hint of evidence that defendants are attempting to comply with the Court's order." Lamberth notes that Chabad has asked him "to impose civil sanctions against defendants based on their non-compliance with the judgment," but states that "[b]ecause of the serious impact such an order could have on the foreign policy interests of the United States, this Court finds that it would be helpful to obtain the views of the United States prior to acting on the motion for sanctions." Lamberth therefore orders that "within 20 days the United States is invited to file a brief stating its views on plaintiff's motion for sanctions." We will be waiting.